Sneakers have been a wardrobe standby since Keds burst onto the scene in 1916, but entrepreneur Gary Gagnon found something lacking in the iconic shoe. For one thing, it isn’t recyclable, which means many a scrawled-upon Converse lies buried in a landfill, never to see the light of day again. With Remyxx, however, Gagnon plans to create a new breed of footwear, one that he claims is the world’s first 100 percent recyclable, completely landfill-free shoe. (More than 300 million pairs of shoes were thrown away in 2011, according to Soles4Souls.) Made from a closely guarded blend of plastic, polyresin “canvas,” and rubber, Remyxx boasts bold colors and funky patterns designed to appeal to all ages. We caught up with Gagnon to learn about his curbside “aha” moment, his wildly successful Kickstarter campaign, and how his shoes will help us all tread more lightly on the planet. What was your inspiration in starting this unique sneaker line? The way I like to say it first is, I did not find sneakers, they found me. My inspiration simply started solely (no pun intended) with my every day go out of my way practice to be an adamant recycler. As a longtime diligent suburban recycler always sorting my mail, breaking down boxes, pulling apart trash to separate the recyclable parts, bringing home my plastic bottle from the movies, never ever throwing away batteries or paint cans in the regular garbage, it wasn’t until I was taking out the trash and saw a few of my boys beaten sneakers and my wife’s shoes sitting in the trash, next to the recycling bin, that I thought, wouldn’t it be nice if we could recycle our shoes, instead? What is behind the sneakers’ designs? Once I decided I was going to make Remyxx cool sneakers, I wanted to make a sneaker that is like no other in footwear, a sneaker that is completely 100 percent recyclable. So, as I began in 2009, I started with the message first and the look later. My message, “keep it out of the earth,” was the basis for developing Remyxx. Remyxx is a brand that not only represents design and fashion but also awareness and sustainability. However, I knew if this was going to work, to sell “sneakers with a purpose,” they would of course need to be cool and stylish for mass-market appeal. The plan in designing with my distinctive material is to use strong colors with clever designs to make Remyxx a brand that not only represents design and fashion but also awareness and sustainability. Does the #5 recycling symbol on each sneaker mean it’s recyclable with #5 plastics? 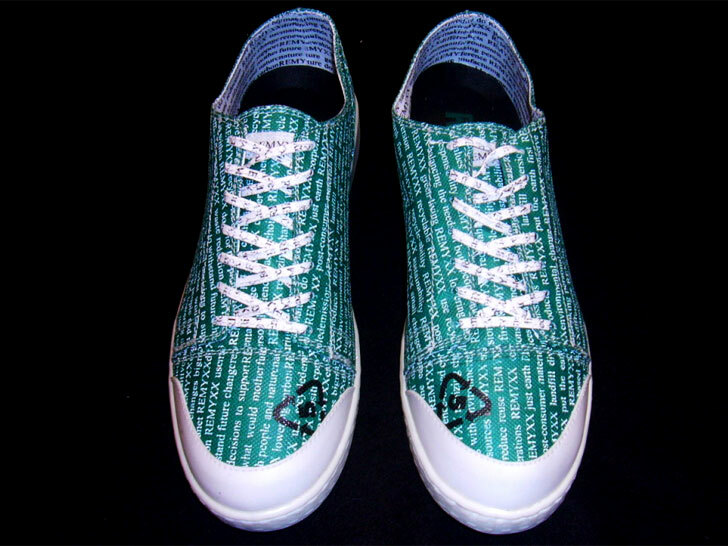 The #5 symbol prominently displayed on my designs does indicate that my sneakers are recyclable as I have technically proven and lab-certified they can go in with other #5 materials like yogurt cups and other food containers. However, the “snag” in dropping Remyxx in your curbside bin is that collection agencies and recycling centers will, at first, only see Remyxx as another sneaker that they will only think to pull it out of the recycling stream to throw it in the trash. The #5 symbol prominently displayed on my designs does indicate that my sneakers can go in with other #5 materials like yogurt cups. That is where it is embedded in our company mission—the Remyxx effort—that Remyxx will advocate and initiate improvements in recycling and sustainability as a brand not only for sneakers but for other materials for the good of the planet as a whole. So, what we are doing before we can reach the ultimate goal that Remyxx sneakers are known and recognized to be accepted and properly processed curbside, Remyxx offers consumers to mail back their worn-out Remyxx to us for proper recycling. For now, it is only in our closed-loop system, that Remyxx can guarantee that [any] old sneakers will in fact remain the only completely landfill-free sneakers in the marketplace. And for the consumers’ supportive, eco-smart effort, they will receive a $5 credit on their next purchase with Remyxx. All of this will be spelled out on the website, shoe tag, and shoe box once Remyxx hits stores in October. What exactly is the “special blend of lab-certified recyclable materials” that you use in the sneakers? What exactly the special blend of lab-certified materials is, I cannot tell you—that is my “secret sauce.” My materials are a development of two-plus years of special chemistry, testing, and retesting. I can only say it is a blend of polyresin that at the end of the Remyxx wearing cycle, all parts, from laces to padding to the sole, can be recycled together to have a second life for zero-landfill impact. 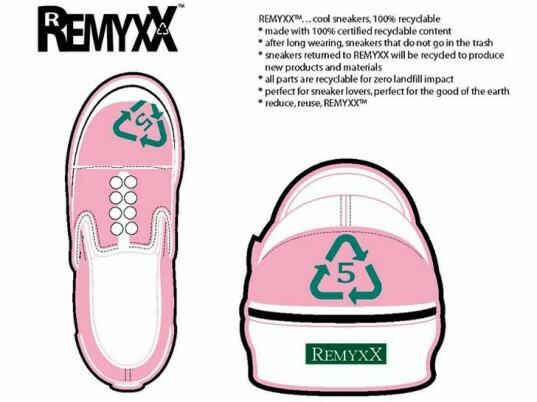 In a year or two, I will be able to say Remyxx cool sneakers are 100 percent recyclable and made from recycled material. In fact, as soon as I can get to the next step of development, with some Remyxx retail placements and sales, when I start to get back my old Remyxx, I should be able to put them back into a new pair of Remyxx. It is where I hope a year or two from now—I need to allow time to get some back—that I will be able to say Remyxx cool sneakers are 100 percent recyclable and made from recycled material. The only point to add here is that I would like to say thank you to the public and press, that I am thrilled that many, many people alike get it. Where I have been receiving hundreds of hundreds of emails and likes, it is very satisfying to see and hear that others understand my vision and recognize the importance. You can preorder your own Remyxx sneakers at Kickstarter. And if you really want to be a part of the Remyxx effort, to be one of the first to receive your own pair or two of Remyxx sneakers, go to my Kickstarter campaign before June 25 to preorder your pair. The first round of Remyxx shoes will be delivered in October. Sneakers have been a wardrobe standby since Keds burst onto the scene in 1916, but entrepreneur Gary Gagnon found something lacking in the iconic shoe. For one thing, it isn't recyclable, which means many a scrawled-upon Converse lies buried in a landfill, never to see the light of day again. With Remyxx, however, Gagnon plans to create a new breed of footwear, one that he claims is the world's first 100 percent recyclable, completely landfill-free shoe. (More than 300 million pairs of shoes were thrown away in 2011, according to Soles4Souls.) Made from a closely guarded blend of plastic, polyresin "canvas," and rubber, Remyxx boasts bold colors and funky patterns designed to appeal to all ages. We caught up with Gagnon to learn about his curbside "aha" moment, his wildly successful Kickstarter campaign, and how his shoes will help us all tread more lightly on the planet.